Not all pepper grinders are created equally. Too often, even the most high end mills loosen and come apart. So when we came across a great review of The Derwent Pepper Mill by Cole and Mason in Cooks Illustrated, we knew we had to give it a try. The verdict is in and our testers agree that this pepper grinder is everything it’s cracked up to be (yes, pun intended). With six settings from fine to coarse, the Derwent brings all new meaning to the phrase pepper to taste. The carbon steel filled grinding mechanism splits peppercorns before grinding them resulting in noticeably fuller flavor and mouth-watering aroma. Cole and Mason is a tried and true English company that’s been providing solutions to spice up the kitchen since 1919. Their tradition of quality and thoughtful design is evident in every aspect of The Derwent Pepper Mill. Its transparent body makes it easy to see when it’s time to for a refill, while its easy-off top makes it simple to load. Of course, no pepper mill would be complete without a salt mill to keep it company. Pass the pepper (or the salt as well). Either way, your taste buds are sure to notice the difference. Hi fellow Grommet Fans! I’m Charlie Wood, Sales Manager for Cole & Mason. 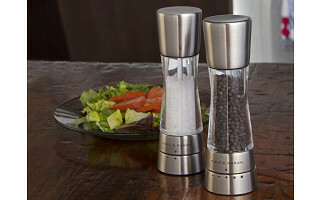 We believe we have the perfect Pepper Mill! The Cole & Mason Derwent is easy to use, has six pre-selected grind settings, and has a grinding mechanism that grinds more pepper and with a stronger flavor. This is the most amazing salt and pepper mill. I have been looking for this for years. I've tested this one for nearly a year and it is amazing. 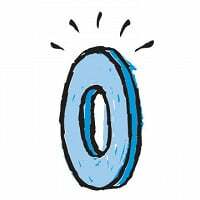 Best Grommet ever! @Desmond We couldn't agree more! This is truly an amazing mill and every home should have one. Thank you for your great support! I WILL have to buy one for my son!! !Not only does it look like a great product, but you see, his name is Mason Cole! @Guest What a wonderful name! Your son will be very happy with a great product like this. They look very sturdy and modern. Where are they manufactured? @Virginia They are designed in Great Britain and manufactured in China and have an award winning Precision Mechanism Technology that guarantee's longevity and performance. I bought these after reading the Cooks Illustrated article too. They're wonderful... the only drawback is that the grind setting markings are painted on rather than engraved and they are wearing off (it's been about 6 months). Not all pepper grinders are created equally. Too often, even the most high end mills loosen and come apart. So when we came across a great review of The Derwent Pepper Mill by Cole and Mason in Cooks Illustrated, we knew we had to give it a try. 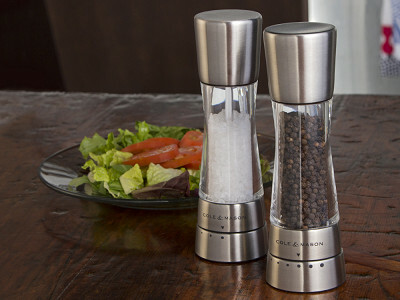 The verdict is in and our testers agree that this pepper grinder is everything it’s cracked up to be (yes, pun intended). With six settings from fine to coarse, the Derwent brings all new meaning to the phrase pepper to taste. The carbon steel filled grinding mechanism splits peppercorns before grinding them resulting in noticeably fuller flavor and mouth-watering aroma. Cole and Mason is a tried and true English company that’s been providing solutions to spice up the kitchen since 1919. Their tradition of quality and thoughtful design is evident in every aspect of The Derwent Pepper Mill. Its transparent body makes it easy to see when it’s time to for a refill, while its easy-off top makes it simple to load.